Diego Simonet (ARG) and Rogerio Moraes (BRA), two of the players who sacrificed resting time to play with their national teams. Same old story for the Pan American players. The disrespectful calendar is showing, once again, the need for a change. New injuries cast a shadow on the Pan American schedule. Who will pick up the ball and make the much needed change for the sake of the athletes? It’s been two weeks since Diego Simonet’s most recent achievement with Montpellier Handball, and I was finishing writing a happy article about how a boy from Buenos Aires conquered Europe with his skills on the court, and charmed everyone with his charisma outside of it. The 28-year-old playmaker lifted the EHF Final 4 becoming the first Argentinian in history in doing so; but not only that, he was named MVP of the weekend and best playmaker of the competition. Quite unbelievable, as he himself said right after the match: “An Argentinian, MVP of the Final 4…that doesn’t fit in anyone’s head”. It was all excitement and pride until last Friday, when the Argentinian Handball Confederation (CAH) announced that our best player, our MVP, was ruled out of the Pan American Championship squad due to a knee injury. And you might be wondering, when did he injure if the competitions are already over? If nothing happened to him on the last match of the French league more than a week ago? Well, Diego Simonet flew to Buenos Aires the day after the that last match of the French league against Dunkerke, and then to the nearly 2600 metres above sea level from Cochabamba, Bolivia, where the Argentinian national team disputed the South American Games. He arrived last Sunday and had his first game on Monday against Chile. After nearly 48hs of traveling. The South American Games give two spots for the Pan American Games, which are the ultimate qualification stage for the Olympic Games. So as you can see, these are very relevant tournaments on this part of the world, and that’s the reason why all of the South American players who play in Europe have made the effort (once again) to sacrifice days off of their holidays to put on their countries’ jerseys and give their last effort to fight for a spot for Lima 2019, the next Pan American Games that will give the champion a place in Tokyo 2020. Simonet flew to Bolivia with no rest and without previous acclimatation to the height, and since the competition had already started, he only played two matches (semifinals against Chile and the final against Brazil). He was not the only athlete who had to go through it though. Nearly all of the athletes who play in Europe did the same: some arrived a day before the competition, some when the tournament had already started. And that’s where I want to stress my concern: this calendar is disrespectful to the athletes. The first thing that has to be said is that this is not anything new. This is a situation that’s been going on for years, ignored by the management of national and continental federations. A claim that has been repeatedly ‘unheard’ by the responsible ones, by the ones that have the power to make a real change. Our athletes are getting injured and no one seems to care. It’s true that neither the South American nor the Pan American Games are organized by the Pan American Handball Federation (PHF). These are big events that are under the wings of the Organización Deportiva Suramericana (Odesur) and the Organización Deportiva Panamericana (Odepa) respectively, so it’s hard to say if they could somehow make these events match with the IHF calendar, as there are many other sports involved. That being said, it is understandable that these tournaments cannot be ‘moved’; but: a) both Odesur and Odepa have representatives from handball federations within their leaderships, b) these are not the only competitions that don’t match the IHF dates. The Pan American Championships, which are the equivalents to the EHF Euros, are also being disputed in dates that take time off of the players scheduled holidays, and these tournaments do depend on the PFH. So going back to what triggered this discussion, Diego Simonet has been excluded from the list of 16 players that will represent Argentina in Nuuk in a weeks time. According with a communication from the CAH, he suffered a traumatism on his right knee during the South American Games, so he won’t be able to perform in Greenland. Regardless of the reason of the injury, whether he was hit, he stepped weird or whatever, one thing’s certain: he played the Final 4 on the last weekend of May, then finished the French league on Thursday of that same week, flew to Buenos Aires and then to Bolivia in 48hs and played two matches at an altitude of 2,600 meters above the sea level. If he hadn’t injured, he’d be training today, getting ready to make a debut in the most important continental tournament next Saturday and play a minimum of 5 matches, and a maximum of 7 if Argentina reaches the semifinals. And Diego is only one of the examples. But there are at least 30 players who are part of European clubs and are also being submitted to this unhealthy rollercoaster, after a long season with their clubs. So while most of the European athletes are resting and enjoying their holidays, the ones from this side of the world continue to work to face a competition that, thankfully for the region, has become tougher. And the only reason why it became tougher is none other than the players emigrating and improving in Europe. So if the athletes are making all of the sacrifices to improve not only for themselves, but also for their national teams, why hasn’t the PHF done its part? What’s taking them so long to move the tournaments from May-June to January and December for mens and womens respectively? Why not making them match the EHF Euro? Probablities of handball becoming professional in any of these countries in South America are definitely very remote. A utopia. For example in Argentina, not only the lack of investment in the sport is a deficit, but also a strong foundation, planification and infrastructure. And as long as this continues to be this way, the management should accompany the athletes in the best way possible, listening to their needs and working for their development. Players of the likes of Eduarda Amorim have already voiced their discomfort with the current calendar, one that is attempting against the players’ wellbeing. While it may sound trivial, there’s one more thing that’s utterly wrong with the dates. The men’s Pan American Championships have been overlapping with the FIFA World Championships, which means the competition in Greenland will very likely go unnoticed by everyone (maybe even by handball fans). By the time the first match throws off in Nuuk, the football will have already kicked off in Russia, so the most transcendent tournament of our continent will, once again, be overshadowed by the most popular sport in the world. Just like in 2010. Or in 2014. How could a sport federation publicize it’s main event when the entire world will be focused on what Messi had for breakfast or on how many times Cristiano Ronaldo stopped for a sip of water during practice? On a simple survey carried out last year among Pan American athletes, 88% of the players aswered that they were not happy with the Pan American calendar. There were rumours that this year’s men’s Pan American Championship would be the last tournament to be played in a date different than that of the EHF Euro. But as of today, there are no news regarding the next tournament, which will be the women’s competition (qualifier for Kumamoto 2019), that should take place in late November and beginning of December, to match the European tournament in France. Actually, there are not news regarding the tournament at all, not the host city nor the dates. The PHF is not exactly going through the best of times as it’s been suspended by the IHF earlier this year, after the rejection of the resolution of the international organization to divide them into two different federations. The PHF has appealed with TAS/CAS (Tribunal Arbitral du Sport/Court of Arbitration for Sport) and in the meantime, all continental tournaments have been supervised by someone from the IHF. So, having in mind that the IHF is the one in charge at the moment, who will take this matter seriously and make real the change all athletes have been waiting for for years? Could the PHF and the IHF step up and work together to finally help our most valuable asset? ← Previous Story Dutch team beat EURO vice-champions! Esse artigo e preconceituoso, porque releva a culpa do calendário apenas aos pobres pan americanos e não leva em consideração o calendário europeu. Todas as federações continentais tem que realizar os torneios nas férias ou recesso dos jogadores, porque então todas as federações continentais não se unem e organizam seus calendários? e não somente a pobre pan americana. O calendário é um grande problema para todas as federações. 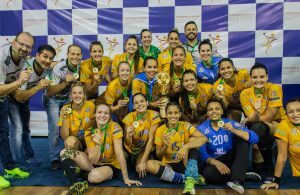 Por exemplo para realizar o campeonato europeu a EHF realiza uma pausa em seu campeonato, mas a pergunta é: A EHF estaria disposta a realizar uma pausa em seu calendário para que as outras federações continentais realizem seus campeonatos? Aí é que está a grande questão.